40956 seen on the 3 back in January, just one of the services changing in July. PH1064253/1 - KEY CABS LTD T/A TAXIFAST, FARADAY MILL BUSINESS PARK, ELLIOTT ROAD, PLYMOUTH, PL4 0ST Cancellation Accepted: Operating between Plymouth, St. Budeaux Square and Plymouth, St. Budeaux Square given service number 222 effective from 06-Aug-2010. PH1064253/2 - KEY CABS LTD T/A TAXIFAST, FARADAY MILL BUSINESS PARK, ELLIOTT ROAD, PLYMOUTH, PL4 0ST Cancellation Accepted: Operating between Plymouth, St. Budeaux Square and Plymouth, St. Budeaux Square given service number 223 effective from 06-Aug-2010. These are the taxibus services which are coming off. 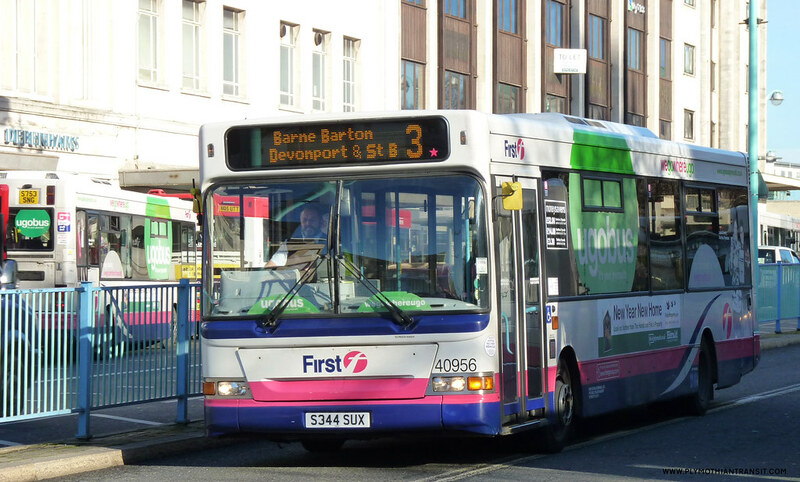 I am suprised to see only the St Budeaux services have appeared here so far, as the Northern Connect services are also stopping from the same date. No doubt these will appear before too long. PH0004983/35 - FIRST DEVON & CORNWALL LTD, THE RIDE, CHELSON MEADOW, PLYMOUTH, PL9 7JT Variation Accepted: Operating between TORPOINT FERRY and PLYMOUTH Bus Station given service number 81/81C effective from 25-Jul-2010. To amend Timetable. PH0004983/330 - FIRST DEVON & CORNWALL LTD, THE RIDE, CHELSON MEADOW, PLYMOUTH, PL9 7JT Variation Accepted: Operating between Plymouth Royal Parade and Goodewell given service number 6 effective from 25-Jul-2010. To amend Timetable. PH0004983/336 - FIRST DEVON & CORNWALL LTD, THE RIDE, CHELSON MEADOW, PLYMOUTH, PL9 7JT Variation Accepted: Operating between Plymouth Royal Parade and Barne Barton given service number 3 effective from 25-Jul-2010. To amend Timetable. PH0004983/395 - FIRST DEVON & CORNWALL LTD, THE RIDE, CHELSON MEADOW, PLYMOUTH, PL9 7JT Variation Accepted: Operating between City Centre and City Centre given service number 13 effective from 25-Jul-2010. To amend Timetable. It is good to see that these changes are all down for the same date as the next Citybus changes. Coincidentally the date of the WNPG Rally on The Hoe. I will be looking more closely at these changes, over the course of the next week or so. PH0000135/13 - PLYMOUTH CITYBUS LTD, MILEHOUSE, MILEHOUSE ROAD, PLYMOUTH, PL3 4AA Variation Accepted by SN: Operating between PLYMOUTH Royal Parade and DERRIFORD Hospital given service number 50 effective from 25-Jul-2010. To amend Route and Timetable.Omnibuses: Half year statement Seems these extra links are working! Busworld Photography: Western National 86 Plymouth to Barnstable Nice shot!